Trinity and Society: The Search for a “New Way” "...in the situation created by the fall of Communism, there is an opportunity – and a need – to consider the possibility that Catholic social principles might imply a more radical departure from current economic orthodoxy than any nation has yet attempted." The result is the present worldwide disaster which, viewed positively, creates an opportunity for radical change. The possibility of change begins with the dawning realization that we have been wrong not just about the economy, but about ourselves. The decisions and policies that have led to the crisis of capitalism were founded on a false view of human nature. We came to believe and act as though the smallest unit from which society can be composed is the individual. It was akin to the old physics: the belief that everything is made of atoms. We now know that everything is inter-related, but while science has moved on, economics has not caught up – until now. The dominant social philosophy tells us that the basic unit of society is the individual, making choices that simply reflect the desires that are uppermost in him at the time. If this is true, two things happen. First, everything tends to be determined by individual desire and its manipulation. We end up with pure consumerism. Second, centralization (or corporatism) becomes inevitable, because a multitude of individuals can be too easily harnessed together. The result is a small group of successful individuals controlling the rest. That can as easily take the form of socialism as capitalism. In the real world, the basic unit of society is not the individual but the family, meaning the set of relationships out of which the individual is born or into which he marries. It is from within this set of relationships that the individual exercises what freedom he has, whether it be moral, economic or political. A shift in philosophical view away from individualism would change everything. If the basic unit of society is understood to be the family instead of the individual, people cannot so easily be detached from the relationships in which they are embedded, including the natural environment on which they are dependent. In other words, if we adopt this person- and family-centered view, truth would come before choice, reality before desire, responsibility before rights. That would make us less easy to manipulate, herd and enslave. “Embedded” individuals are not morally any better than the free-floating individuals in a consumerist society, but their interests are different. One way they differ is by being likely to take a long-term view, because while an individual lives only briefly, a family or group lives potentially for ever. Consequently, to the extent that our affections and identity are bound up with such a group, we will seek sustainability (environmental as well as economic) rather than immediate advantage and self-indulgence. As Philip Blond has also argued, the only way out of our present crisis is through a kind of decentralization that used to be called “distributism”. We need to turn things around and base them on the person, the family, and the locality. Others, such as the G.K. Chesterton Institute for Faith & Culture and Allan C. Carlson of the Howard Center for Family, Religion and Society have been promoting these ideas for years. Localism can take many forms: family-owned businesses, community-supported agriculture and Local Exchange Trading, co-operatives, credit unions, micro-finance initiatives like the Grameen Bank, guilds… In many cases there are already successful models of good practice available that could be applied on a larger scale. Whether anyone will take note of these examples before things get much worse is another question. Today’s real radicals are not socialists who believe in big government stepping in to control everything in their name. Nor are they capitalists who still believe that economic competition alone, unregulated, will work in the interest of the common good. The real radicals want to turn everything upside down and base it around the family and the local community – on cooperation rather than competition, with government merely protecting the conditions under which small community can flourish. Very thoughtful, thanks for posting. What do you think are the biggest hurdles keeping small local families or coops from doing what you suggest right now? Is what you suggest more a change in collective philosophy, or more the goal of political policy? Very helpful article, hope to see you write more on this topic. It never occured to me before that the smallest unit is the individual and how that plays against our family model. Most dicussions on politics seem to favor a “head in the clouds” mentality. That is to say, a bunch of attractive, good ideas, but with no real chance for these to be implimented. How do you see the government making this shift from individual to family, especially with the philosophical underpinnings of our Constitution and modern man in general? 1) Inheritance taxes: bad perhaps? 2) Limits on corporate size? 3) Limits on interstate corporations? 4) Bring back restrictions on interstate banking? Perhaps these ideas are too big, maybe a thousand small steps first? Can’t the model outlined in the article be established without changing laws? I mean, individual families or groups could do any of that right now. I know people who do, some who do some hybrid between capitalism and distributism. What I’ve always liked were the coops that seemed to have grown organically or without a lot of forcing. There are lots of family businesses today, they don’t run according to big corporate business models. My accountants always complained me that I don’t follow traditional practices (meaning MBA-style), I’d have to educate them that profits are not my entire goal, the good thing is that I could decide, and not be forced to do it their way. This article is a perfect compliment to Rod Dreher’s “Crunchy Cons” book. As Caldecott has said before, the idea of left and right in politics has outlived its political usefulness. Everyone seems to be seeking a blend and a return to traditional values in an enlightened time. Rod Dreher’s book outlines how this would look. In Jim Collins’s “Good to Great” the evidence suggests that truly great companies, Nucor Steel for example, already understand the importance of the family as a nucleus of society. And how there seems to be a relation between successful companies and leaders who have kept their individualistic egos in check. The evidence keeps piling up and pointing towards something small, something humble, something true. Like a new small and humble family in a stable perhaps. Follow the star. Dreher’s “Crunchy Cons” book encourages small-scale, locally based agriculture through tax incentives. But, he also rejects government involvement in social engineering. He is inconsistent. The problem is the tax code in the first place, it is corrupt. I think Americans are currently free to establish whatever lifestyle they prefer, corporate owners are free to structure whatever compensation thay think best. (this includes stock owners—if you own stock, how about using your buying choice to “vote” for companies you think get it right?) Employees are free to work for whomever offers them a job or relocate in pursuite of happiness—however thay define that. The concept of “small is beautiful” is fine, I just reject any notion that government, or my fellow citizens, have a right to choose that for me and my family. I do agree that Americans are generally ignorant about very important things that impact their lives and are in need of real education and spiritual revival more than anything. 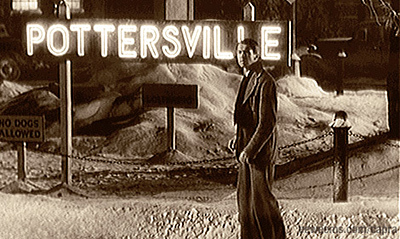 I watched “It’s a Wonderful Life” this weekend (pictured above) and noticed an important point: The hell of Pottersville wasn’t the result of capitalism, it was allowed to happen in the absence of one good man. The moral of the story isn’t that one man’s liberal social engineering makes for decent society, it is that one man’s Christian virtue can make all the difference. The other difficulty arises because everyone, whether they admit it or not, has a mix of family-characteristics and individual-characteristics. If you’ve ever made a decision that goes against the grain of your “family”, you’ll realize that the author is not preaching pure freedom, but communalism—albeit on a small scale. Finally, the “Pottersville” image is somewhat misleading because I don’t think the author’s ideas would find much sympathy in Capra’s Catholic theology—he recognized the individual’s right and responsibility to act. Read the above post’s reference to “one good man”: Capra’s films balanced the roles of family member and individual in a nuanced fashion. It seems to me that the reason why it is “tremendously hard to implement practically” is that we are already living in a system that is radically weighted toward individualism. My husband and I have a small farm that we are trying to slowly move toward sustainability—we want to be producers and not consumers. But we want to participate in a local economy that doesn’t exist. After I homeschool my children, run my farm, and do freelance writing for extra cash, I spend all my extra time working to co-found a real farmers’ market because there is nothing like it here in our fairly good-sized town. The town is bending over backward to accommodate a Loews and a super-Walmart—re-building highways, creating tax incentives, etc.—but the people who want to create a market for local farmers and craftsman to sell local products to local people can not get a couple hundred dollar grant from the town or the county. It is sad and pathetic. Look, we have to stop thinking in terms of people’s freedom being crushed. Working for Walmart is not freedom. Owning your own piece of land, having the means of production within your grasp—or at least in the grasp of your neighbor next door—that is freedom. With all due respect, if you cannot tell the difference between this and communism, you don’t know the difference between sustainability and slavery. It is like the difference between contraception and openness to life—one brings apparent freedom that is actually just license and the other brings true freedom married with responsibility. That is not to say that we should all be farmers. I am the farmer here, not my husband. He is the off-farm income, the writer. I believe in freedom to create, to take initiative. For every ten Joe farmers, there is at least one free-thinking rebel—but even for this individual, freedom can only be fulfilled in the context of the family and the community, at least broadly considered. Thank you Caldecott for this timely article that tolls like a church bell just before Mass. The Catholic family or the domestic church will out live the polity of our times, while enjoy its journey. I tend to agree with Jason “If you’ve ever made a decision that goes against the grain of your “family”, you’ll realize that the author is not preaching pure freedom, but communalism—albeit on a small scale.” except I would substitute “tribalism” for the “c” word. Dishonoring the family values in some parts of the world can have murderous consequences even today. Then as to “Pottersville” I think that Chassup has it closer to the mark when saying “The moral of the story isn’t that one man’s liberal social engineering makes for decent society, it is that one man’s Christian virtue can make all the difference.” Jason,once again seems to caution against the transference of rigid orthodoxies and his analysis that “Capra’s films balanced the roles of family member and individual in a nuanced fashion.” is closer to the mark. Nuance and mystery remain the hallmarks of any celebration of reason in religious faith. I am not a Libertarian. I am a Catholic. However, I am convinced from my study and reading, for example The Revolution, by Ron Paul, that the Libertarian party is the closest thing to Catholic politics in America. And free market capitalism is the closest to Catholic economics. I strongly agree with CHASSUP, here, above, that, “The hell of Pottersville wasn’t the result of capitalism… The moral of the story isn’t that one man’s liberal social engineering makes for decent society, it is that one man’s Christian virtue can make all the difference.” The protagonist is the person, with his conscience and the infinite needs and desires of his heart. The person is never an isolated individual, even if he violently believes himself to be a true anarchist. Even his anarchy is inherited from and lived within a society of like minded persons. And Jesus Christ places all of his unhedged bets on the person, from Mary to the Pope to you and I. Sin and conversion always apply to the person, mediated by and realized in community. See also “The Victory of Reason: How Christianity Led to Freedom, Capitalism, and Western Success by Rodney Stark”. See an interview with him, “Rodney Stark Faith, Reason and Legend”, in the January 2009 issue of Traces at http://www.traces-cl.com/home.html. RICK KUSHNER asks, “What does family economics look like?” Great question. I can tell you, it ain’t what we got now. For years, I’ve instructed my kids to work at something they’re passionate about and work hard to be excellent, save money, avoid debt, obey laws, stay close to God through their Catholic faith, make the tough decisions based on what is right, be kind, live the life of a decent human being so others may be encouraged to do the same, to dutifully remain proactive as citizens to fight for justice and mercy. Our current economic environment, our current culture—the society surrounding us—looks very little like the world I envisioned for my children, and the chasm is quickly widening lately. Our “modern, advanced society” rewards immorality, failure, mediocrity. The legislation coming out of Washington these days—the last century—is a disaster. Not only does it fail to improve the human condition, it actively worsens the root problems we endure, it feeds the weakness and frailty of a citizenry that moves farther from God. We are surrounded by fellow Americans who seem willing to accept the faustian bargain being offered: freedom from fear and worry, freedom from personal accountability, freedom from guilt, freedom from temporal inequality, all at the cost of God-given human rights to personal liberty and property, the cornerstones of the God-centered, family-affirming system established in the US Constitution. The trade they are making will disappoint, the contract is a fraud, it will cause great human suffering and, in the end, seek to deny individual personhood. As RICK KUSHNER stated above, the individual must be free to be himself, but is made for relationship with other selves, willfully fulfilling our true purpose. The societal systems must be free to reward success and goodness while punishing failure and evil. Our certainty of good and evil is revealed to us by God through His laws, the family is the natural incubator of the larger society adhering to this truth. I understand and believe that wealth is NOT “equitably” diffused with rampant capitalism. The problem, however, is whether the current paradigm is any different. Now we have politicians, not the market, deciding winners and losers. Barney Frank is helping Banks in his state, Obama’s Adminstration wants to give hundereds of billions to GE because their CEO and lobby group stongly backed BHO during the campaign. So, do we want market produced winners or losers or do we want the politicians to decide? SCALIA, While agreeing with your sentiment, I chafe at a term you use; “rampant capitalism.” What is that, what amount of profit is not rampant, at what point do you consider capitalism out of control? I prefer to blame individual willfulness for “rampant” behavior, not an economic system that, if left alone, allows individuals to be good or bad. I trust the goodness of human nature more than I fear its inclinations to do evil. No matter what you think, capitalism itself is morally neutral. The laws we use to guide that system are morally motivated. It is my argument that capitalism left unfettered is the greatest wealth generator we have, it is up to individuals, local communities and all of us as a nation to strive for, enact and enforce moral laws to steer the system’s power to cultivate virtue while punishing vice. As for your question… “winners” chosen by an objective and free market most closely mirror God’s creative signature, therefore is my choice. It’s all very well to say these things, but only the Government, in the end, has any chance of standing up for the rights of its people to own property and raise a family. The unions showed their fragility and human failings when they were crushed and subdued in this country by Thatcher. Yet the few property-owning people left seem highly unlikely to stand up for the renting (including mortgages, renting til death) masses. They are financially and culturally implicated in the main financial/social establishment, which is pretty much explicitly out of touch with common people. A religious justification for solidarity seems a necessary starting point; otherwise I can’t see the rich, even the trendy middle-class rich, becoming open enough to support the non-owning majority. Oh, yeah, my original train of thought; back last century when Chesterton and Belloc went down these lines, they didn’t shrink from attempting to affect the highest statesmen; Belloc himself became an MP. Your statement scares me. At least here in America, the government possesses no people… the government IS the people, of the people, by the people, empowered by the will of the people. Further, the rights you mention—property and raising a family—are enumerated in our declaration as “life, liberty and the pursuit of happiness,” not to be confused with state-delivered promises or entitlements. We don’t suffer under a class system as you describe, except for the marxist groupism the state habitually tries to force upon us. Here a “renter” or non-owning person has the opportunity to become an owner, even a landlord if he desires. All that stands in the way of his attempts are obstacles of the state or the limitations in his own mind. Its faultless ever actually to jaw these things, but lone the Government, importance the end, has chip chance of twist upgrowth for the rights of its people to own property and raise a family. You express these points beautifully. Positive and significant model-shifting change needs to begin with the individual & the family. There is simply no way around this.